Paper size: 28.5 x 40.8 cm. Self-printed in an edition of 50 at the end of 2015. Made for the Mead Art Museum of Amherst College exhibition Unimaginable by One Mind Alone (April-July 2016). The curators of that exhibition invited contemporary artists to react and interact with prints from the William Green collection, thus creating unique works of art joining the old to something quite new. In this case, Paul Binnie imagined what could have happened if Japan had NOT been closed to all outside influence. 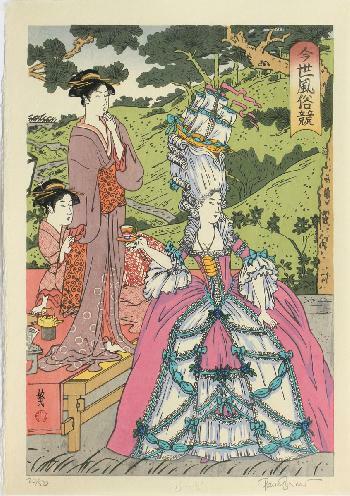 He chose a 1780 print by Katsukawa Shuncho and introduced a young woman proudly showing her French court dress, her equally 1780 hairdo and Louis XVI teacup. Fine impression, colours and condition: carved and printed with incredible attention to detail! Detail 1 shows the Shuncho diptych that was used by Paul Binnie, and which is in the Met in NY.